This is a prime lens manufactured by Sigma and the model was launched 2000. 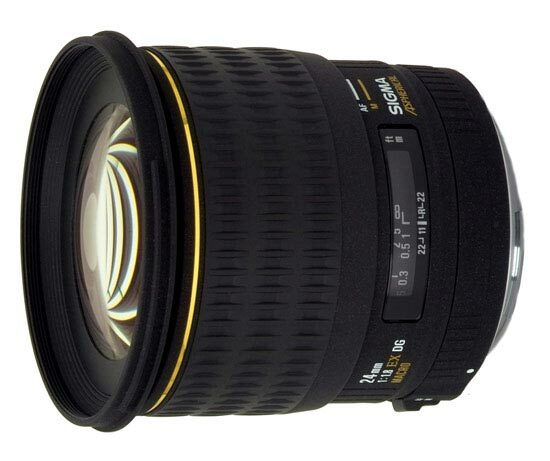 If you buy this lens it will come with a lens hood, whose model name is "LH825-03 432/440 ". Text from Sigma: "Sigma’s 24mm F1.8 EX DG Aspherical Macro lens is a large aperture wide angle lens giving photographers freedom of expression with the ability to set the desired aperture and get as close as 7.1 inches allowing the photographer the juxtaposition between near and backgrounds in the distance. The 84º angle of view is perfect for landscape photos while also great for shooting group shots without distorting the subjects at the edge of the frame and compact enough for working in tight quarter with a single subject. This lens is perfect for photo journalists where it is essential to have a fast, wide angle lens, scenic, social and full-time professional photographers who are in need of a hardworking lens. Extremely compact within the category of super fast wide angle lenses and totally aqffordable for the professional as well as aspiring professional and student photographers!